Political activists from West Papua fear that their people might be heading towards extinction. A two day seminar hosted by Auckland University’s Law Faculty focused on media freedom in West Papua and the ongoing oppression by Indonesia and New Zealand’s responsibilities in the region. Activists and leaders are worried that the increase in Indonesian migrants and repressive government policy towards West Papuans have left their people at the risk of being driven out and from their lands. Political activists are using this month’s [August] “Pacific shame” seminar in New Zealand to highlight the plight of indigenous West Papuans, and some say they fear the extinction of their people. The two-day event, hosted by Auckland University’s Law Faculty, focused on media freedom in West Papua, Indonesian oppression, and New Zealand’s responsibilities in the region. Paula Makabory, a West Papuan political activist living in exile in Melbourne, fears that unless action is taken, her people will become outsiders in their own land. 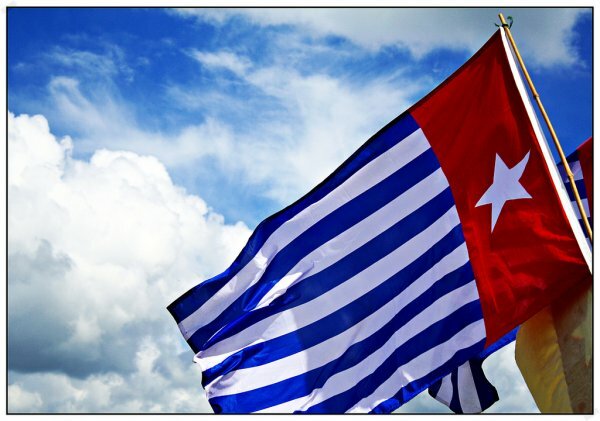 “If you look through the census data, you can see that the West Papuan population growth rate is increasing five percent a year, and in the world it’s only one percent, so how come in West Papua it’s so high? The ethnic contours of West Papua have changed rapidly since Indonesia assumed control of the region in 1962. In 1971, indigenous Papuans accounted for 96 percent of the West Papuan population. That figure has now dropped to 48.7 percent, and if current trends continue it will likely fall to 15 percent by 2030. Human rights activist Maire Leadbeater says this is colonialism in action. When Indonesia gained independence from the Netherlands in 1949, the region then known as Dutch New Guinea was not included in the newly-formed republic. The Netherlands prepared it for independence, and a West Papuan state was declared on the December 1, 1961. However, the Indonesian government had other plans and annexed West Papua in 1962. The move was supported by the US-led Western bloc, which saw Indonesia as an ally against communism. A vote was held in 1969 on West Papuan independence – the “Act of Free Choice” – but only 1025 men were allowed to vote, and all were pressured to support Indonesian integration. West Papuan journalist Victor Mambor says since then, the Indonesian government has pursued a brutal policy of oppression. “Many West Papuans have been killed, and many harassments and violations against West Papuan people have happened,” he says. Journalists in West Papua are frequently threatened, and a colleague of Mambor’s was strangled and dumped in the river. The police refused to investigate his death, declaring it was “suicide”. Mambor says the world needs to know about what is happening. “It’s not about special laws, it’s not about being part of Indonesia or being independent, but it’s about the truth,” he says. It’s a truth that has been largely ignored in New Zealand. When West Papuan activist Benny Wenda visited last year he was refused permission to address Parliament, over fears it could upset the Indonesian government. But Green MP Catherine Delahunty believes the rights of the West Papuans should come before diplomacy. On July 30 , she tabled a motion in the House calling for the President of Indonesia to commit to press freedom in West Papua. “We need to acknowledge that what is happening in West Papua is very reminiscent of what New Zealand did in 1860, right down to the treason laws, so we actually have a big responsibility to do something to challenge the role of Indonesia,” she says. Delahunty says she is deeply concerned by the Indonesian government’s refusal to acknowledge the indigenous West Papuans, and challenged the Indonesian ambassador at a recent Green Party conference. “I said, ‘we cannot accept your government’s position, we will never accept it’, and that’s what the Green Party will continue to do until we see real progress,” she says. The plight of the West Papuans has also caught the attention of many within the Māori and Pacific communities. A collaborative called Oceania Interrupted was launched last year, and founder Leilani Salesa says the group is committed to fighting for their West Papuan brothers and sisters. Oceania Interrupted has held several actions over the past year, beginning with a show of support for an activist who was jailed for raising the West Papuan flag. “We raised the flag 15 times at intersections up and down Queen St, 15 being symbolic because that is the number of years Felip Karma is currently serving in jail,” says Salesa. “Our second intervention was called All We Want For Christmas Is A Free West Papua, and the social space we interrupted was the Otara Market. Victor Mambor says it is important for New Zealanders to stand in support of the West Papuans. It’s a message echoed by Oceania Interrupted. “We stand in solidary with them as humans, with them as Pacific people, and with them as indigenous people,” says Salesa.